PESCO: EU’s alternative to NATO? The division between European states, from a strategic point of view, is there for all to see. What common strategic interests already link only Eastern and Western partners when they have completely different goals? This inability to find a common plan on which to act is the reason why NATO is still substantially alive. Because nobody could find a credible alternative . Is there a European alternative to NATO? But are there really any alternatives? 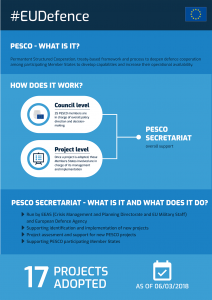 The question, for many, is contained in Pesco , that is, the permanent structured Cooperation . This is what has been defined as the Common European Defense. Officially established in December 2017, 25 States currently participate: Austria, Belgium, Bulgaria, Cyprus, Croatia, Estonia, Finland, France, Germany, Greece, Ireland, Italy, Latvia, Lithuania, Luxembourg, the Netherlands, Poland, Portugal, Czech Republic, Romania, Slovakia, Slovenia, Spain, Sweden and Hungary. Notice that the article points to the end of NATO and the need for an alternative. It points to PESCO as a possible alternative, and then says that the USA and UK will oppose EU military unity and that the USA and UK are anti-German allies. Well, yes, there will be a separation between Europe and the USA-UK alliance. 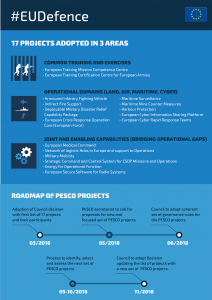 Now that the NATO summit is past, that will also likely motivate EU nations to give PESCO further consideration as an alternative to NATO. While the article in Foreign Affairs considers that PESCO is good for the USA, it seems to not realize the ramifications of its first few statements. When Europe has to pay more for defense, it will demand a greater say in how the funds are spent as well as what to do with its military capabilities. Contrary to the view in that Foreign Affairs article, this will turn out to be disastrous for the USA and its Anglo-Saxon allies like the UK and Canada. It has been (correctly) reported that PESCO is about war, not peace (see ‘PESCO is not about peace, it is about preparing for EU wars’). But PESCO will be more than about some small war, what is happening in Europe (whether or not the term PESCO will be used) is going to result in World War III. While his timing was off by many decades, we are seeing German-dominated political (European Union, which will reorganize per Revelation 17:12), economic (Eurozone), and military alliances (PESCO) beginning to rise in Europe. Expect to see church involvement in the future as well. US President Donald Trump’s style, statements, and pressures are getting Europe to look for an alternative to the USA-dominated NATO. This does not mean that Europe will pull out of NATO. It means that the Europeans will develop military capabilities that they can use on their own as well as against the interests of the USA-UK. Europe does not have a great army yet, but PESCO may well be the instrument under which such an army is developed. Europe is being pressured by Donald Trump to arise militarily. The world will be surprised when conquering by Europe happens, which is part of why I have long written that European technology will be a key factor in this (as will be deception and problems in the USA). While Europe has been relying on the USA for defense, after developing more of its own military the time will come when Europe will conclude that it not only does not need the USA, but that it would prefer to destroy it! The Europeans are mad at the USA for many reasons including its President Trump, the UK for the Brexit vote, and will decide that places like Canada are too connected to them to remain. Europe is looking for an alternative to NATO. Currently, that looks like PESCO. This will not turn out well for the USA or its Anglo-Saxon descended allies. This entry was posted on Wednesday, July 18th, 2018 at 7:00 am	and is filed under Prophecy.